Looking to Buy a Barcode? EAN-13 and UPC-A graphics – EPS (scalable vector) and 600 dpi JPG. Barcodes are provided at 1.5″ x 1.0″ (38.27mm x 20.3mm) and can be scaled +/-20%. Our very comprehensive Resource and Support Guide. Please note: UPCs/EANs are good for all products except items sold by variable weight (Meat, Bulk Products, Produce), Books (require ISBN) and Pharmaceuticals. 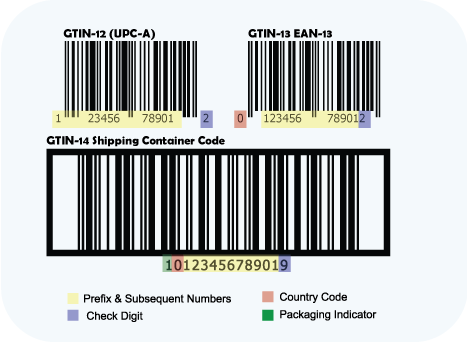 What’s the difference between barcode, GTIN, UPC and EAN? The term “Barcode” is a very general term that means any optical scanning symbology ranging from UPCs to the barcodes on direct mail pieces that you get. The real term is GTIN which stands for Global Trade Identification Number. GTINs are a family of numbers and are all related. The GTIN-12 is the same as a UPC-A. GTIN-12 stands for Global Trade Identification Number – 12 Digits. The GTIN-13 is the same as the EAN or EAN-13 and is a 13 digit number. The GTIN-12 (UPC) is used exclusively in the United States and Canada and the GTIN-13 (EAN) is used outside of the United States and Canada. UPCs do not have a country code and EANs do. The additional leading digit on the EAN is the country code. Since we are a U.S. Based company, our EANs will start with a zero. These can be used worldwide. 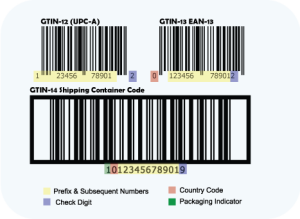 The other barcode in the illustration above is called a GTIN-14 or a shipping container barcode. This is part of the family of barcodes and sometimes your retailers will ask you to have one on the master container. The first number is a packaging indicator and should be any number between 1 and 7, the next number is a zero, the following 11 digits are the first 11 digits from the barcode used for the items inside the master container and the last number is a check sum (or check digit). If you need these, we can create these for you. The reason that these are sometimes used is so they can automate their inventory receiving and warehouse management. Retailers require barcodes because UPC Barcodes are used to convey prices to the electronic cash registers in stores and are also used to help manage inventory. By managing inventory, the retailer knows when to reorder products that have reached reorder points. How many UPCs or EANs will I need? You will need one for each product or variation of the product that you sell. If you are selling an item that comes in a variety of styles, sizes, and colors, you will need one for each variation. Each of these items is a SKU (Stock Keeping Unit). Each SKU is tracked individually so each item needs it’s own UPC or EAN barcode for tracking. UPC barcodes are used in the United States and Canada – these are 12-digit barcodes. EAN barcodes are used elsewhere – these are 13 digit barcodes. All Products, Food, Beverages, Clothing, CDs, Car Parts, Hardware, Tools, Nutraceuticals, all use the same version of a barcode. If you are selling worldwide, here is a good article about how to combine EAN and UPC barcodes. How do I get a UPC (or EAN)? You come to Nationwide Barcode. 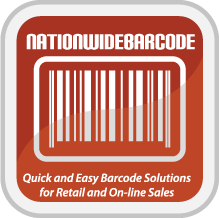 Here is an article about the differences between GS1 and Nationwide Barcode. We own a large number of prefixes. These prefixes belong to us and each one allows us to generate 100,000 UPC and EAN barcodes. Although these prefixes may be under other trade names that are under our care and control, the individual UPCs and EANs that we sell have never been used. We guarantee that these numbers are pristine….not duplicated or previously used. We continue to own and manage the prefix and are selling you a subset of the UPCs and EANs that we own. If you go to the GS1 and search the prefix, it will list the original manufacturer name. 90% of retailers do not require that you have your own prefix. They simply take the barcode number along with your product info and enter it into their inventory system that connects to their Electronic Point of Sales systems. The following stores depending on your national and regional scope may require a direct relationship with the GS1: Lowe’s, Home Depot, Walgreen’s, Sears, Nordstrom’s, Neiman Marcus, Ace Hardware, K-Mart. Certain EDI/ESI and logistical companies who do business with Walmart and Kroger may also have the same requirements as Walmart and Kroger. If you are listing your products on Amazon and doing your fulfillment, we may be a perfect solution…if you are tied into Amazon EDI they may require a direct relationship with the GS1. You should discuss acceptance of barcodes from a reseller vs. GS1 before making your purchase If you are planning on selling to Walmart/Sam’s Club, J.C. Penney’s. Kroger’s, Macy’s or other stores that tie the UPC prefix into EDI (Electronic Data Interchange) you will need to get your UPCs directly from the GS1. Effective September 28, 2014, if you are working with Amazon’s EDI system, they require a direct relationship with the GS1. If you are selling brand-name merchandise that is listed in the Amazon Brand Registry you need to use that UPC. If you have registered your own brand name in the brand registry, this may require you to go direct to the GS1 for your own prefix. IF YOU ARE SELLING ON AMAZON READ THIS ARTICLE! What’s the difference between You and some of those other guys? We can’t speak for all of those other guys, but we can tell you that there are some resellers who charge way too much, there are a couple who make up numbers and there are some who are legitimate. The thing to look for is how comfortable you feel with the company that you are going to do business with. We wrote the definitive guide to barcodes (Barcodes Demystified) with excerpts from George Laurer, the inventor of the UPC Barcode. We pride ourselves on providing you with all the information you need to do business and integrate UPCs into your product line. Look at their websites…then, look at ours. We do this because you are important. We sincerely appreciate you. We are Better Business Bureau Accredited. This means that we have proven to them that we are an ethically based business (with no unresolved complaints). We have been deemed “one of the legitimate guys” by George Laurer – the inventor of the UPC Barcode. He co-manages the Authenticated UPC Directory website and we provided him with all of our contractual information showing that we are legitimate. We are Trustwave certified – this indicates that we have a secure site that means a strict level of internet compliance. Once you place your order for your Barcodes, you will be directed to a page where you can download your UPCs. What do I do after I get my UPCs/EANs? You either include the barcode graphic as part of your packaging design or (if it’s already done) get barcode labels. We’ll get you great prices from our friends at Pacific Barcode. They are fast, too. You are now ready for business and can start selling your products to stores We have sold barcodes to clients who in turn sell on Amazon, to Lowes, Staples, Whole Foods, Trader Joes, Office Max, Target and thousands of other stores. Click here to read some recommendations. Do I need to register my UPC barcodes? There is no formal EAN or UPC database of products either nationwide or worldwide. You supply the stores with a list of your products, product details and the UPC/EAN number for each item. We also own UPCBarcodes.com – this is an optional registration service for U.S/Canadian companies that we provide where we push the data from the site to a variety of search engines. There are several reasons why you will want to upload your product to the site. You are formalizing the ownership of your UPC Barcode. If anyone ever made up a number that coincidentally was the number you own, you can use this as quick and easy proof that you own the number. It’s marketing…additional marketing is always good. This becomes an inbound link from our site to yours and will help with SEO of your site. There is nothing embedded in a UPC or EAN barcode except for the numbers that are beneath the barcode. When they enter the info into their database, the numbers are associated with your product. When a barcode scanner scans the barcode, it turns the bars back into numbers and looks for the item associated with it.